Pilates is an innovative and safe system of mind-body exercises that uses a floor mat and a variety of equipment. Pilates exercises define your muscles without adding any excess bulk – creating a longer, leaner body shape and a flattened abdomen. Pilates builds functional strength that seamlessly pairs with any other activity and helps you feel lively and energetic throughout your day. 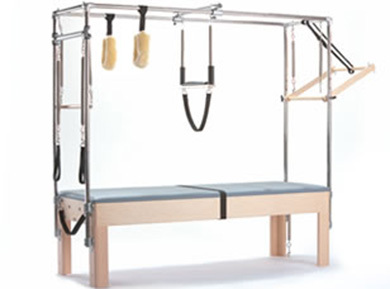 At Tru Pilates we use the reformer and trapeze table – designed by Joseph Pilates and staples of the classical pilates workout. 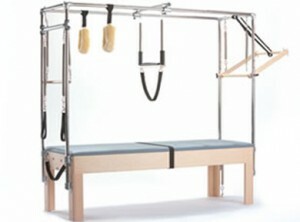 These dynamic spring-based machines promote length, strength, flexibility, and balance with each exercise. Pilates equipment offers adjustable resistance and instability which not only challenges you but also helps you keep perfect form. The result is an intelligent and intuitive way to build strength, define your core, and develop mind-body connection. If you’re looking for a rigorous yet mindful workout that will help you feel stronger in all aspects of your life, equipment-based pilates is for you. Knowledge of the core muscles is powerful and will spill over into your everyday activities, helping you build a wide range of strength, prevent injury and increase overall mobility. At the end of your first session, your body will feel strong and energetic from working hard, while your mind will remain relaxed and grounded from a deeply centering workout. Tru Pilates specializes in helping our clients get in the best shape of their lives. We tailor our sessions to the specific needs of each individual client. We provide a tranquil and rejuvenating atmosphere where you will strengthen your body, spirit and mind.